Microsoft finally pulled down the curtain on Windows 10 just last week and with the double-digits came promises of holograms and a revamp that will see the OS push the company into an era of subscriptions and constant updates. Where small businesses are concerned the new OS could be in situation where it is still trying to persuade certain firms to move over from Windows XP, even though the end of life was supposed to take place almost a year ago. What features will help it to do this though? Much to the chagrin of its user base Microsoft got rid of the start menu in Windows 8 and it makes a triumphant return on Windows 10 complete with a brand new interface. The Windows 8 tiled interface owed a lot to touchscreen devices and that explains why the live tiles still remain in some capacity in order for it to be an OS that spreads across all platforms - an advantage for BYOD policies. Everyone loves a freebie and the best news of all is that Windows 10 comes as a completely free upgrade for Windows 7 and 8 customers. So if you really hate what Windows 8 has done for your business rest assure that when 10 comes out you can get it free of charge - for a year at least. 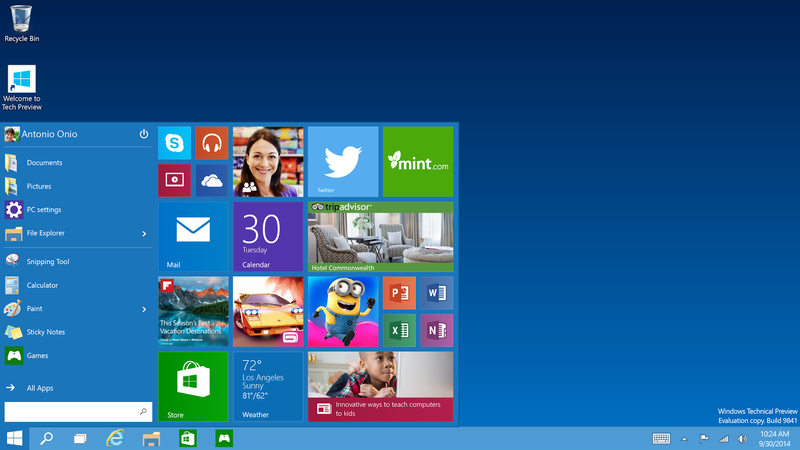 You’ve downloaded Windows 10 as a free upgrade but what about when it’s outdated? Microsoft will support your version of Windows for the entire lifetime of the device or devices in question through regular updates. It’s likely to have teething problems at first but after a while this new OS attitude will add value to your small business. Nothing has been confirmed by Microsoft and we might be jumping the gun but there have been hints of a new security feature that can keep your enterprise’s files extremely safe. It’s rumoured this would work by employing data separation at file level and removing the requirement for enterprise apps to be run inside a “container” that cannot be used by other apps on the machine. Under the new method files would stay completely secure when used across all devices or even uploaded to the cloud. It's really good instruction for because my SMB now need windowns 10 installation. After this, I was in trouble that how I should to manage but best essay au help me to find out unique work.